Tribesmen in Pakistan have rallied against Islamabad's alliance with the US after an air strike on an alleged militant camp at an Islamic school. At least 10,000 people protested in the north-western town of Khar near the site of Monday's missile attack. President Pervez Musharraf said the 80 people killed were militants, not students as protesters say. But a raid survivor told the Associated Press that children had died and the school had not been used by militants. In his first comments since the raid, Gen Musharraf said those killed were "militants doing military training". "We were watching them for the last six or seven days - we knew exactly who they are, what they are doing," he told a conference in Islamabad. "Anyone who says that these people were innocent [religious students] is telling lies," he said. But Abu Bakar, one of three survivors from the raid, disputed the president's version. "There was not militant training in the madrassa," he told the Associated Press (AP) news agency from his hospital bed. "We had come here to learn Allah's religion," said the 22-year-old from Loi Sam, a town 15km (10 miles) from the destroyed school. 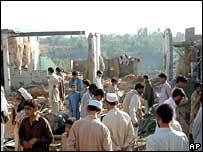 The tribesmen in Khar - the main town in the tribal Bajaur district - chanted "Death to Bush", calling for a holy war, or jihad, against America. The crowd shouted "Yes!" as local pro-Taleban elder Inayatur Rahman said a "squad of suicide bombers" had been prepared to target Pakistani security forces. Small protests were held elsewhere in Pakistan, including in Karachi and the city of Peshawar, the main city in North West Frontier Province which borders the tribal Bajaur district where the strike took place. Prince Charles, the heir to the British throne, had been scheduled to visit Peshawar. But the prince's spokesman said the trip had been cancelled following advice from the Pakistani government. 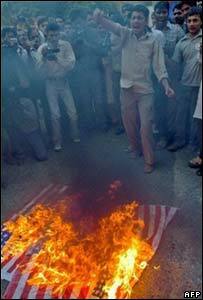 US and Pakistani military spokesmen have denied reports from some locals that the missiles were fired from a US drone. The Pakistani military say they carried out the raid from helicopters. Pakistani military spokesman Maj Gen Shaukat Sultan told AP that "intelligence sharing" had taken place, but later denied saying that US-provided intelligence had been used in the attack. In Kabul, US military spokesman Tom Collins denied any role in the attack. Maj Gen Shaukat Sultan has also denied reports that the military were trying to kill Al-Qaeda's second in command, Ayman al-Zawahiri. "The specific target was the militant training facility... we had no intelligence regarding Ayman al-Zawahari's presence in the camp," he told the BBC News website. Qazi Hussain Ahmed, a senior leader of Pakistan's Islamist opposition coalition, the MMA, was travelling to Khar in a convoy to offer his condolences, a spokesman said. "They killed 80 teenagers who were students of the Koran," Mr Ahmed said, describing the strike as "very cruel joint-activity" between the US and Pakistan governments. The attack came as the Pakistani government was due to sign a peace deal with pro-Taleban militants in the Bajaur area, which correspondents say now appears to have failed. A militant commander in Pakistan's South Waziristan tribal area, and a signatory to a similar deal agreed in 2004, said he would send men and equipment to the Bajaur militants if a tribal conflict developed with the Pakistani army. Haji Mohammad Omar told the BBC the deal still stood, but that if the Pakistani army "brutalised" the people, as he said it had in Bajaur, there would be war. Sympathy for the Taleban and al-Qaeda among tribesmen in Bajaur is believed to translate into active support, the BBC's Barbara Plett in Islamabad says. Pakistan has deployed nearly 80,000 troops along the border. They are there to hunt militants who sought refuge after the ousting of the Taleban in Afghanistan in 2001.